Digitalsmiths, the TiVo subsidiary that specializes in content discovery, has come out with their Q3 report on the state of OTT services, cable, and content – and it's every bit as enlightening as their Q2 report was. 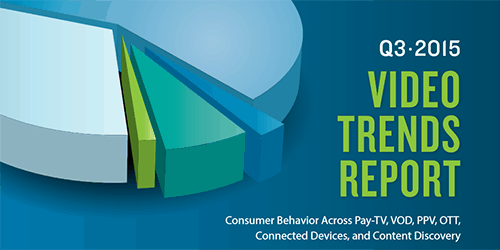 They've polled more then 3,000 consumers and combed through the data to unearth key trends and surprising facts. Here's everything you need to know about the latest survey data from Digitalsmiths. IT's no surprise that cord cutting remains a growing trend, but Digitalsmiths notes an interesting 11.8% increase in the number of cord cutters that are using antennas to access over-the-air broadcasts. We've long been proponents of using antennas to get free content, so it's encouraging to see more cord cutters picking up on the benefits of antennas. If you're not sure which antenna is right for you, just check out our helpful guide. Good news for Hulu: more people know what the heck it is. Digitalsmiths found a growing consumer awareness of major cable alternatives. Hulu was the biggest winner, but Digitalsmiths found an general increase for the whole group of OTT services in the graphic below. Overall awareness of this group of OTT services is up 7.8% in six months, which is really quite impressive. Netflix was left out of the group, presumably because it is used by cord-havers as well and obviously has great brand awareness already. 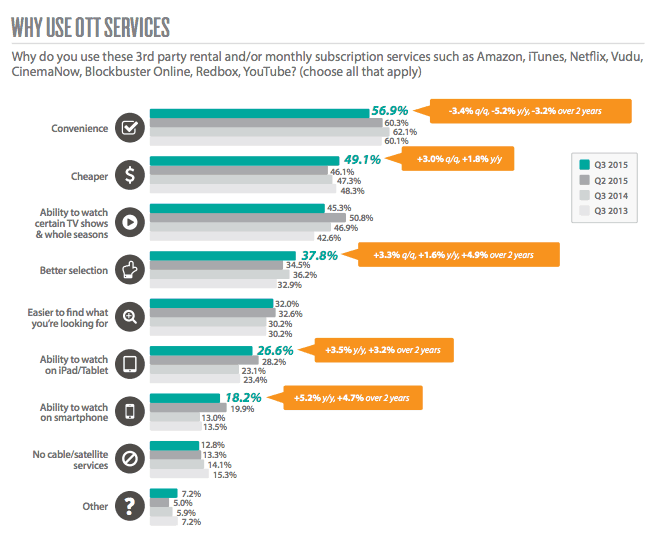 Speaking of Netflix, they're still the dominant choice among OTT subscribers. Hulu finishes second among pure OTT services, though it's third if you count the rapidly-growing Amazon Prime, which of course includes other benefits besides the OTT service. It's interesting to see RedBox lumped in with these OTT services. To us, that speaks to the common-sense basis of cord cutting – it's not about promoting Netflix and co., it's only about saving money and increasing convenience. That means integrating other solutions (like RedBox, OTA broadcasts, etc.) besides the OTT services that we talk so often about here. What Do You Watch On? Digitalsmiths also examined the ways in which people watch their content. There aren't a ton of surprises here, but it's interesting to note that gaming console ownership is declining. Perhaps this is because more OTT-specific alternatives are now available, like the long-anticipated new Apple TV and the Amazon Fire TV. It could also be a result of the gaming capabilities of machines like the Fire TV and the new Chromecast. Of course, mobile devices are as popular a choice as ever. The cable industry seems to be responding a bit better to this, as an increased number of respondents who said their cable companies offered a “TV everywhere” app. We love these Digitalsmiths surveys because they take such a wide view of the industry and the problems it faces. Some people view cord cutting and cord having a bit too dogmatically – in reality, we're all cord cutters because it's cheaper, not because we blindly hate the cable companies (well, except for Comcast users, perhaps). In these surveys, we get the big picture of how smart cord cutters are able to replace their cable more cheaply by a variety of sources. It makes sense to us that more cord cutters have discovered the benefits of having an antenna. It also makes sense that convenient physical rental services like RedBox are still doing just fine. Clearly, cord cutting isn't a trend that is going to fade anytime soon.